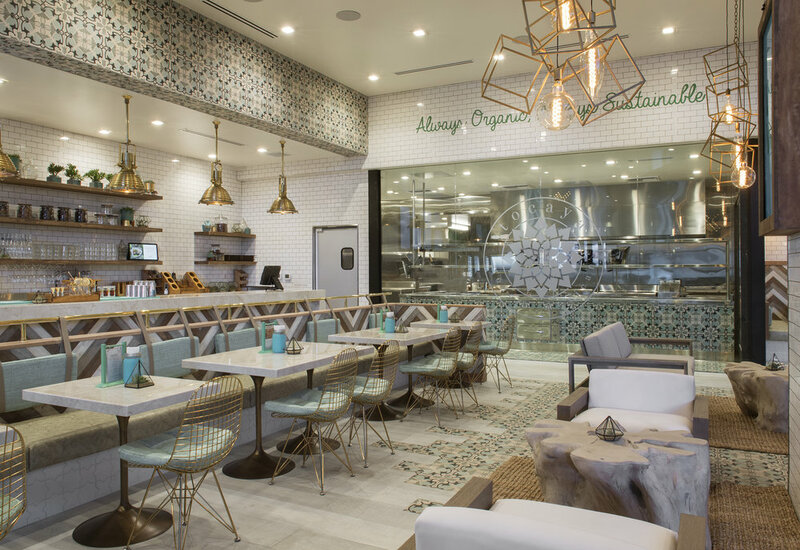 Within this framework, The Madera Group’s modern organic Mexican restaurant Tocaya Organica illustrates that a fast-casual restaurant can be beautiful and stylish. 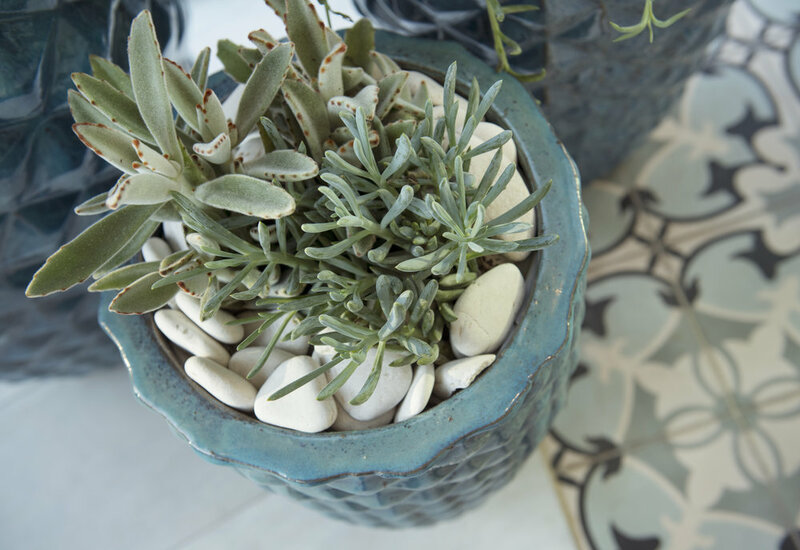 Like its other locations, this one aligns natural materials and neutral colors with sly swatches of vibrant color. The 4,000 square foot space is marked by high ceilings and tall sliding glass window panels that seamlessly merge the indoor dining space with the spacious patio. Textural contrasts abound. 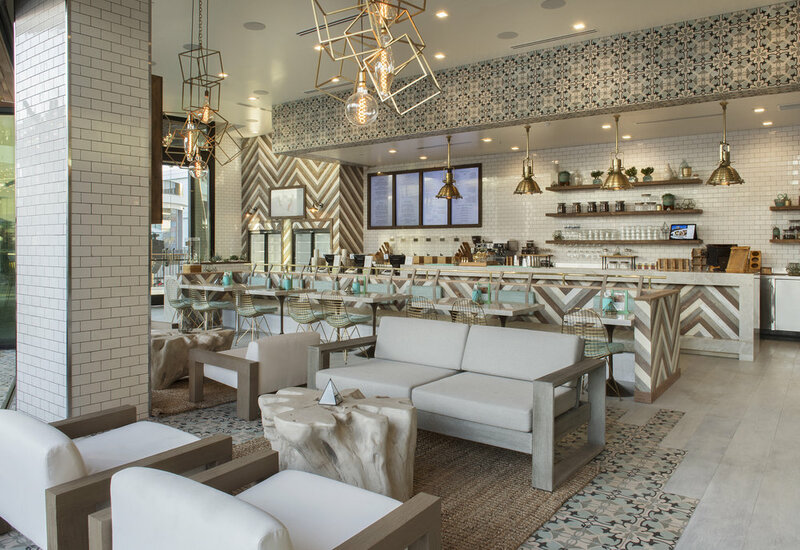 Patterned cement tile, soothing minty greens and watery blues, rough wood planks arranged in a herringbone pattern, marble table tops and brass accents — including iron grid chairs and modern lighting fixtures — set the stage for a space that feels polished, modern and inviting whether the occassion is a work lunch or pre-movie dinner date. On the tables, brightly painted mason jars holding cutlery and terrariums with living succulents underline the restaurant’s informality. Textural contrasts abound. Patterned cement tile, soothing minty greens and watery blues, rough wood planks arranged in a herringbone pattern, marble table tops and brass accents — including iron grid chairs and modern lighting fixtures — set the stage for a space that feels polished, modern and inviting whether the occassion is a work lunch or pre-movie dinner date. On the tables, brightly painted mason jars holding cutlery and terrariums with living succulents underline the restaurant’s informality. The casual yet beautiful environment is the ideal setting for reimagined modern Mexican cuisine that is fresh, intriguing and organic. Choose from salads, bowls, tacos and burritos with with your choice of proteins and queso. There are even vegan options! Tuesday’s all day happy hour offers two for one tacos (we highly recommend the Cali Green with Chicken Tinga, either in their homemade corn tortillas or wrapped in butter lettuce) and bright, flavorful drinks. Order a margarita and watch the people go by. There are worse ways to spend the afternoon.